Hello, friends and hello, spring! 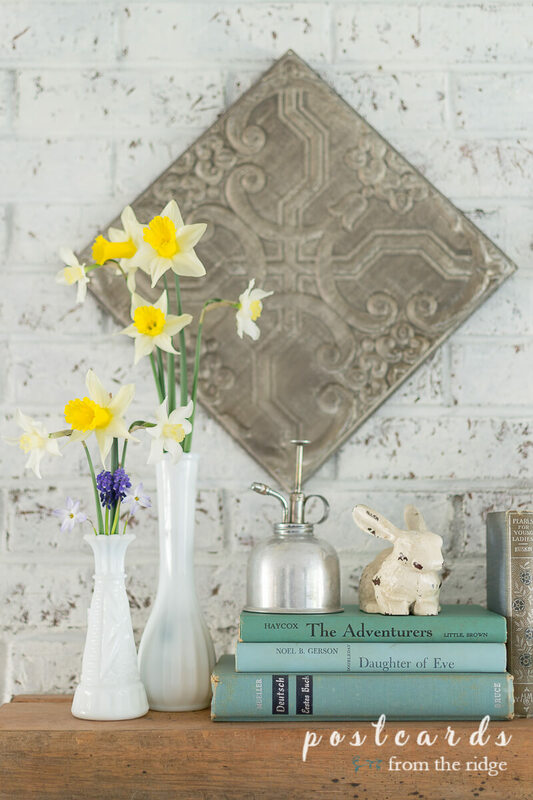 Are you ready for some spring mantel decorating ideas? It's been a long dreary winter and I'm so happy it's pretty much over with. 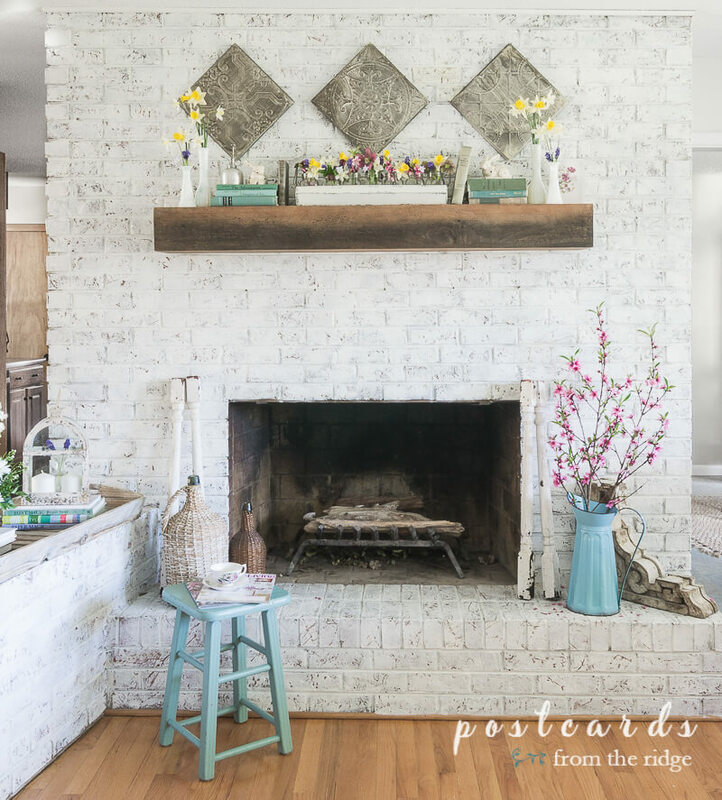 To celebrate, I'm sharing some ideas for creating a natural, rustic spring mantel today and joining lots of my talented blogging friends as we kick off the Spring Ideas Tour. You can find inspiration for many areas of your home, indoors and outdoors, so be sure to check all of the links below. We'll be sharing all week! 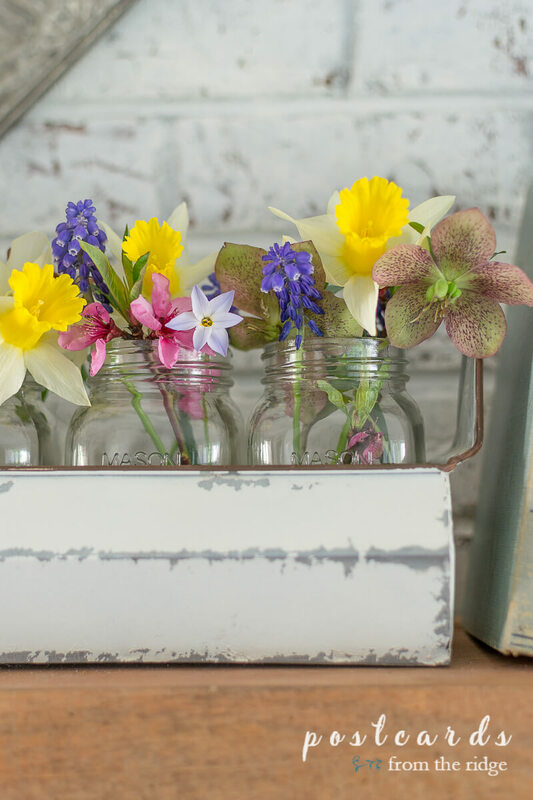 Here's our rustic, natural, vintage-themed spring mantel. We're fortunate to have a yard with lots of flowers and blooming trees and bushes and I love to clip them and bring them inside. 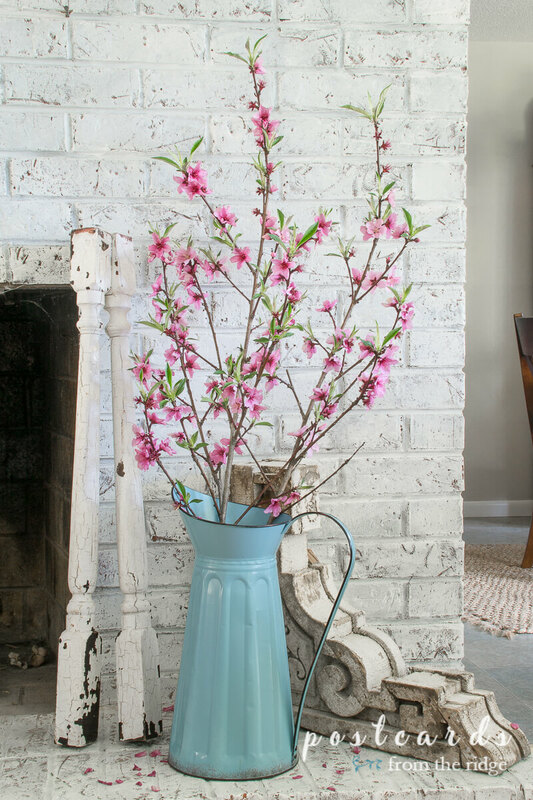 One of my favorites is our peach tree with its vibrant pink branches that are placed in my new vintage-inspired blue pitcher. The yellow daffodils are blooming and look so pretty with the little grape hyacinths and the little purple and white flowers. I don't know what they're called. If you know, leave me a comment and let me know too! 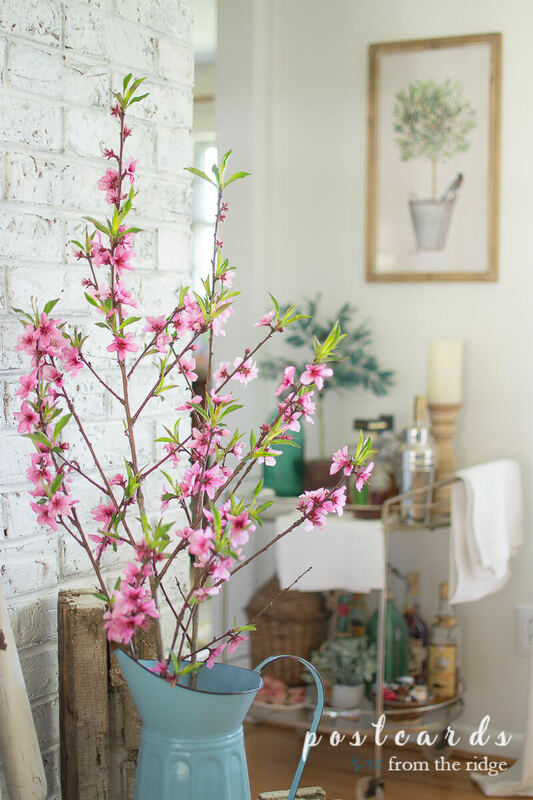 More of the peach blossoms, daffodils, grape hyacinths along with a few Lenten roses are added to some little mason jars and placed in a vintage-inspired chicken feeder planter. 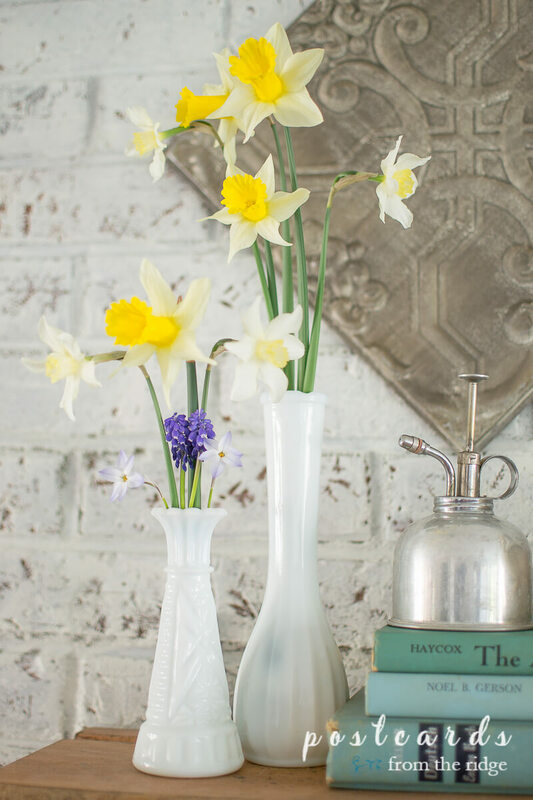 White milk glass vases are a great way to display stems and small branches and are very affordable. If you're lucky you can find them at thrift stores or yard sales. I used to see them all the time but they're not easy to find any more. There are always a ton of them for sale HERE. A flower mister is a must for plant lovers, right? And even though this vintage one doesn't actually work, I love using it as decor. I found it at an estate sale a couple of weeks ago and couldn't resist it. Artificial flowers - they last forever and there are many great sources for them. Some of my favorites are found HERE. Another favorite thing of mine is vintage or reproduction decor. 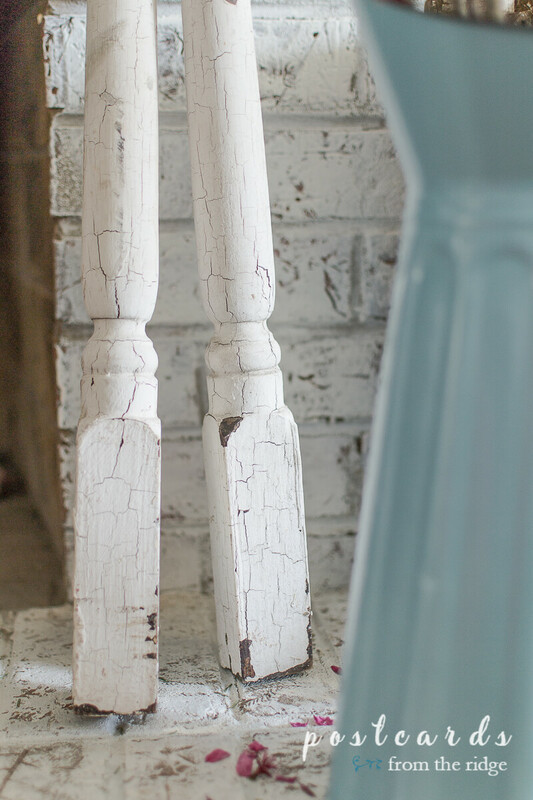 It always adds charm and patina to any area. 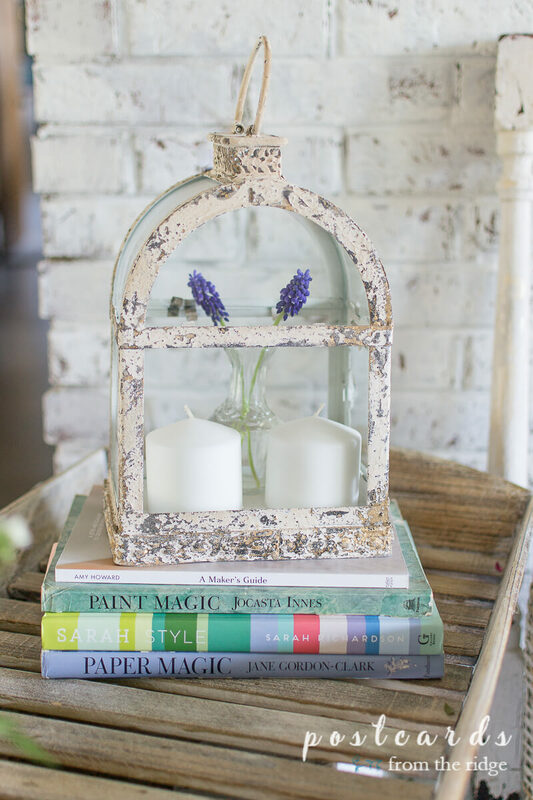 The vintage inspired metal candle lantern looks like it's really old but is actually new. It mixes nicely with my authentic antiques. I found these old chippy spindles in an antique shop in Charleston last month. They help fill in the empty vertical space next to the fire box. I had no idea where I was going to use them and I wasn't actually looking for spindles. Not that I ever find what I'm actually looking for, lol. But they were a good price and fit in the back of my car so I HAD to get them, right? I love it when I find unique items when we travel and can remember our trip every time I see them. For a bit of warm texture, I added some of my vintage wicker demijohns. I have several of these that I've found on visits to Asheville and love the patina they add to any vignette. 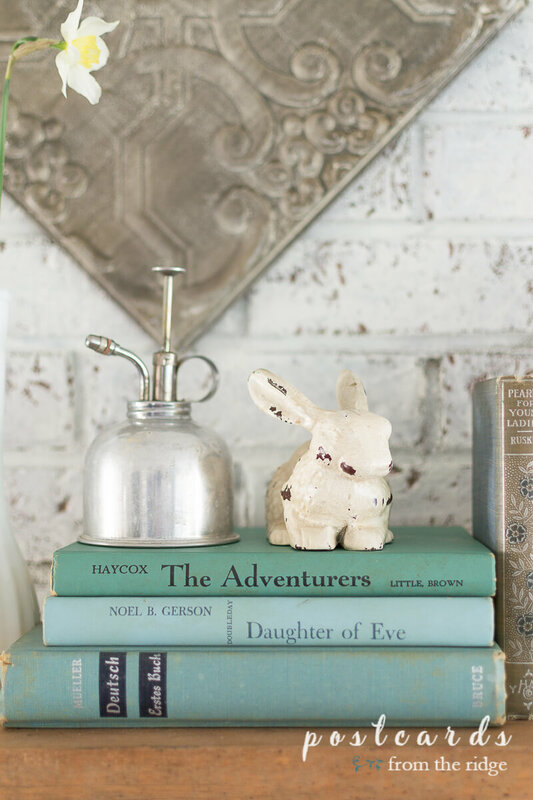 Old books are a great way to add color and patina to any shelf, table, or mantel. I have them in almost every color and switch them out each season. They're the perfect spot for my little cast iron bunnies. 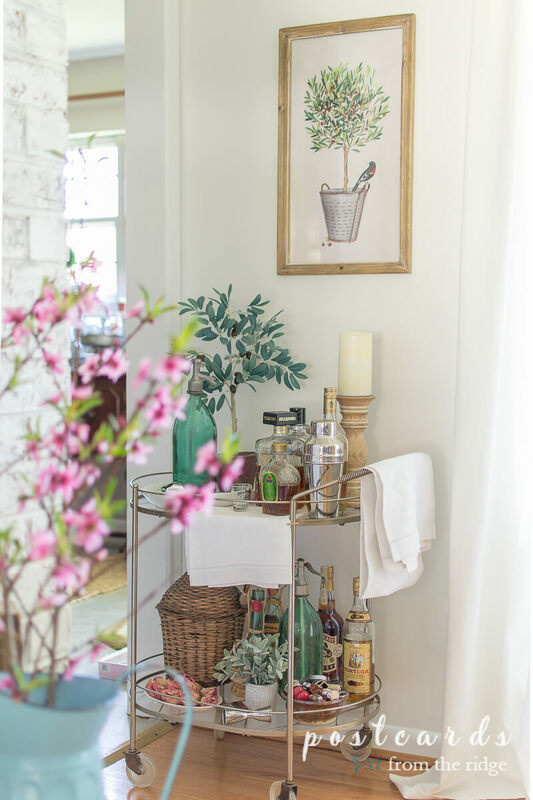 Off to the side of the fireplace is my vintage bar cart, dressed for spring. 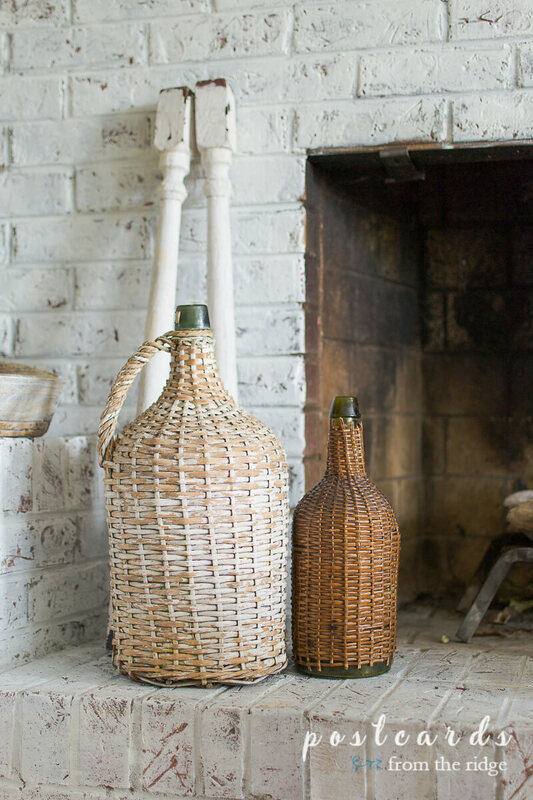 A couple of vintage seltzer bottles, old wine bottles, and another vintage wicker demijohn add more of the vintage vibe in this spot. I added the the little olive tree for some height. And I hung the wall art with the vintage bucket and olive tree for fun. It fits the space perfectly. It really does look like we're booze hounds, doesn't it? To be honest, we don't drink much at all. I think I've had all of these bottles of booze for at least a year, and some of them for several years! It's a good thing they don't expire. Anyone want to come over for cocktails and help me empty them? 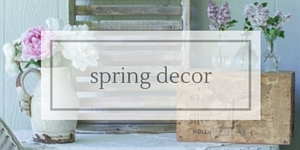 For all of my spring decorating ideas since 2011, go HERE. 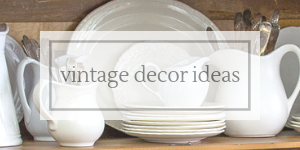 To see all of my ideas for using vintage items in your home, go HERE. 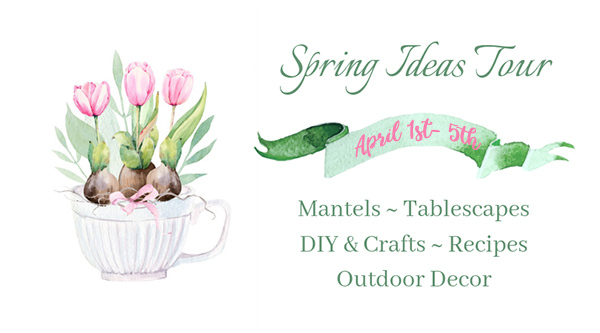 And now here are all of our great spring ideas! 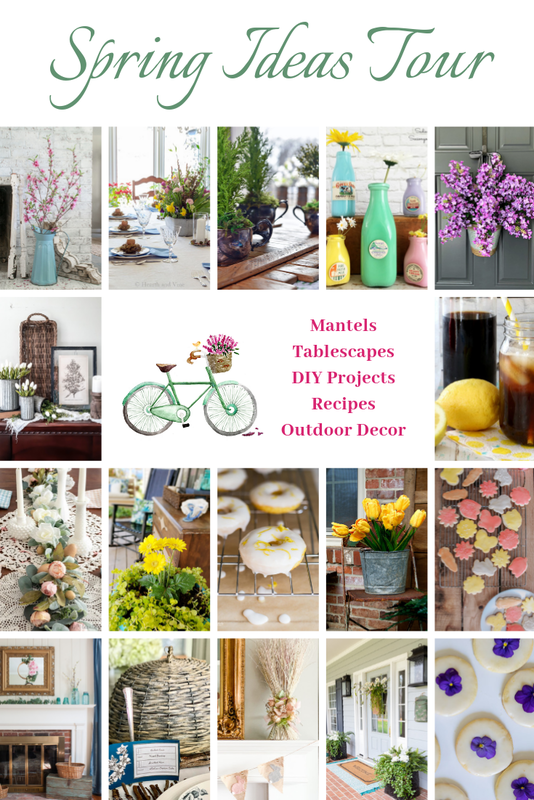 Visit all of my blogging pals to see their creative decorating ideas and check back all week for each day's new posts. 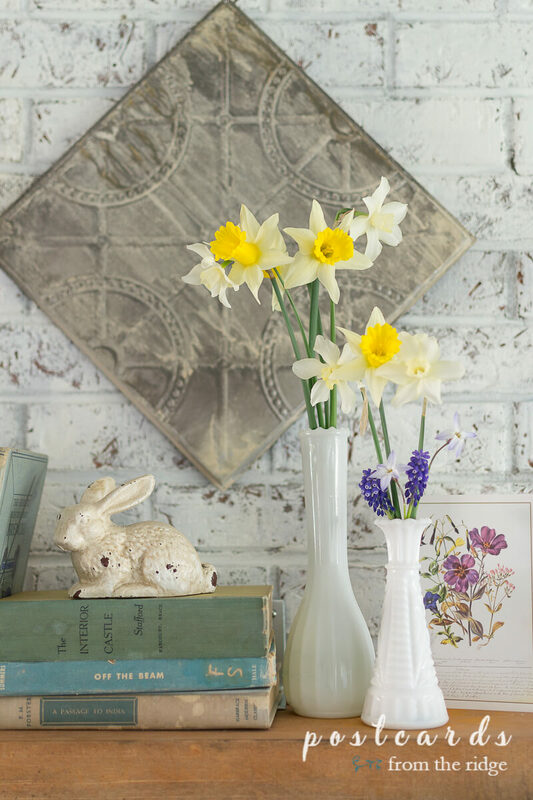 Have you decorated for spring yet? What's your favorite area to decorate? Let me know in the comments below. Your mantel is lovely, Angie! 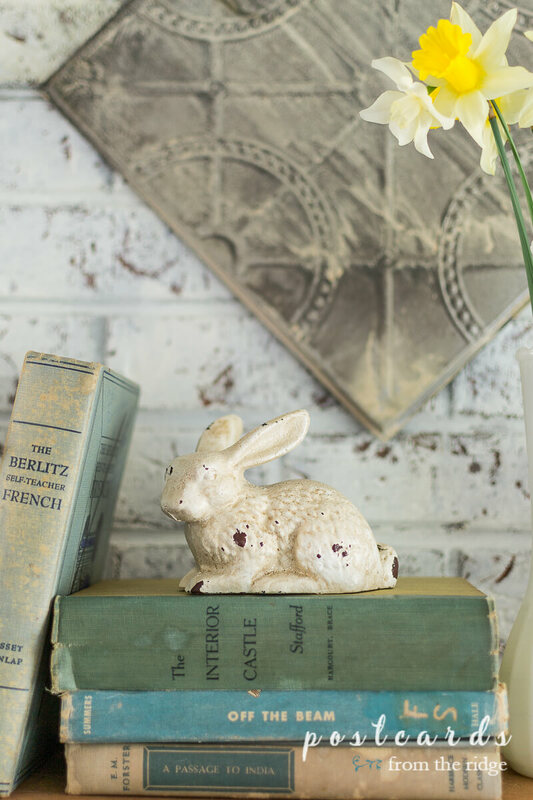 I love seeing how you incorporate vintage and items from your shop in your decor. Adding spindles to fill in an empty space on your fireplace wall is a great idea and a unique way to enjoy your latest vintage find. Your yard must look so pretty with everything blooming. Thanks for hosting this tour. I'm looking forward to enjoying all of the ideas I get this week. 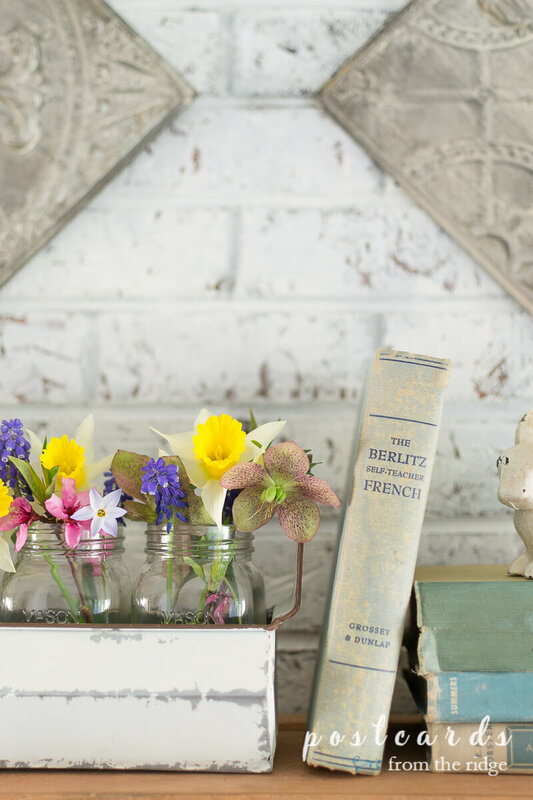 Angie, I love the way you have decorated your mantel with fresh flower and beautiful antique finds. And, it's so great that you have given us so many resources to recreate our own. PS: The little lavender and white flower look like starflowers to me. Hey there friend! What a beautiful mantle! Wish I had a lovely peach teee... just dont grow in our sandy soil. Thanks for the spring inspiration! I know we are all ready to welcome the new season!!! Thanks, Lynn. Funny thing, we have trees just sprout up in our (large, somewhat neglected) yard and that peach tree was one of them. I didn't even know we had it until I noticed the pink blooms a couple of years ago! The perks of neglecting the way-back part of the yard, lol. Also, I can't wait to see your recipe! Your mantel always makes me get a case of mantel envy, Angie! I have one, but it's got an ugly T.V and soundbar, and electronics on it:( I always love to see how you transform yours for the new season! Love all the springtime color and the flowers you have growing already! Lucky you! Thanks for hosting such a fun, idea filled week! Oh Wow, everything looks positively divine!! I sure wish I had your knack for decorating! Thank you Sarah! I wish I had your knack for making the amazing and creative items that you're always sharing! I love all of your gorgeous fresh flowers and your pretty vintage decor! Thanks so much for letting me participate! So pretty, Angie! Love all of the fresh flowers with the pops of turquoise and your vintage finds! Thanks so much for hosting another great tour! You always put together the prettiest mantels, Angie. I love how complete it all looks, without being over done. And that beautiful branch of flowers in the tall pitcher......Is it weird that I'm most envious of something so simple?!?! Love all these spring vibes! Your fireplace is gorgeous! Love all those pretty pastel colors you have used against the white of the brick. 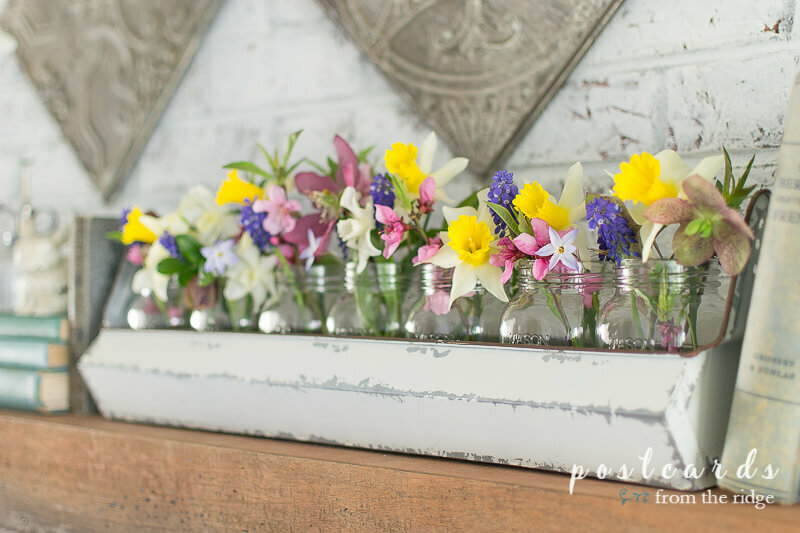 Beautiful spring decor! So beautiful! Love the fresh flowers and the mix of different vases for them.... so pretty!! !